Happy Holiday Cheer link party mantle day! 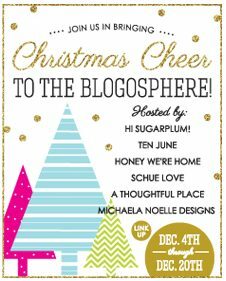 Michelle at Ten June is our host and you can link up your mantle at her blog. As you know, we don’t have a fireplace or mantle in our house, so the console table in our entryway functions as our “mantle”. This year, I shopped our house and came up with this Christmas mantle. I started with the gold Z Gallerie runner that I used on our dining table for Thanksgiving 2011. 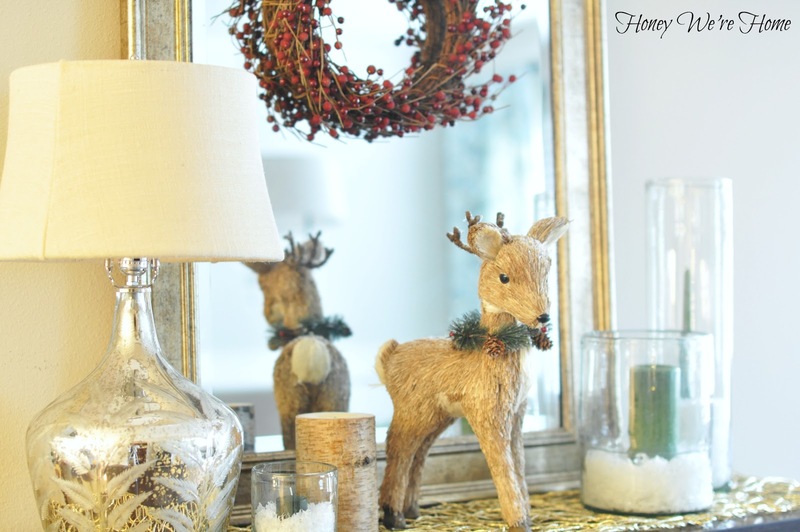 Then I added the three Pottery Barn candle holders with green candles and faux snow. The fois bois candle is also from Pottery Barn. One of my favorite things is this Pier One reindeer. He’s so sweet and adds some charm to the mantle. 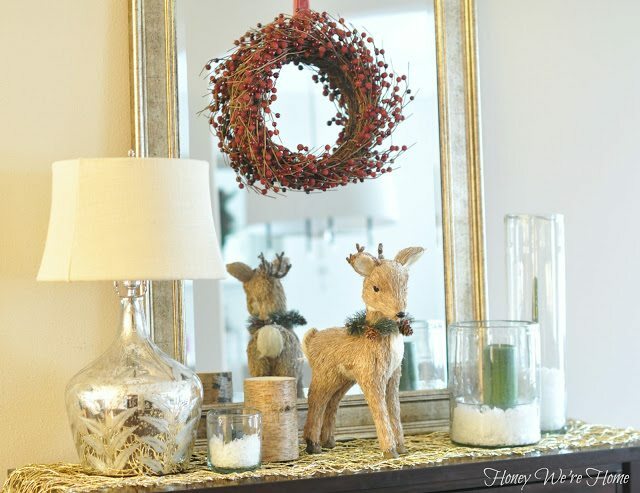 Finally, I added the twig and berry wreath for some color and I’m loving adding touches of red throughout our home this year. See you over at Ten June! Please grab a button! I get so excite when I see your blog post. You have a great taste for decorating. Where do you put your stockings? They are hanging from the iron scroll on our stairs now- I'll have to take a pic. Completely adore your mantle! You do the best holiday decor. So pretty! I love that lamp!! I so so so love when a blog I read constantly posts about a different blog! Then I get myself hooked on another blog with more great ideas! Thank you! I love all the gold. The fake snow in the candle holder looks great with that green candle. I love it's beautiful simplicity. So sweet. He is darling. And so fun to see the sneak of the tree. It's beautiful. So pretty! 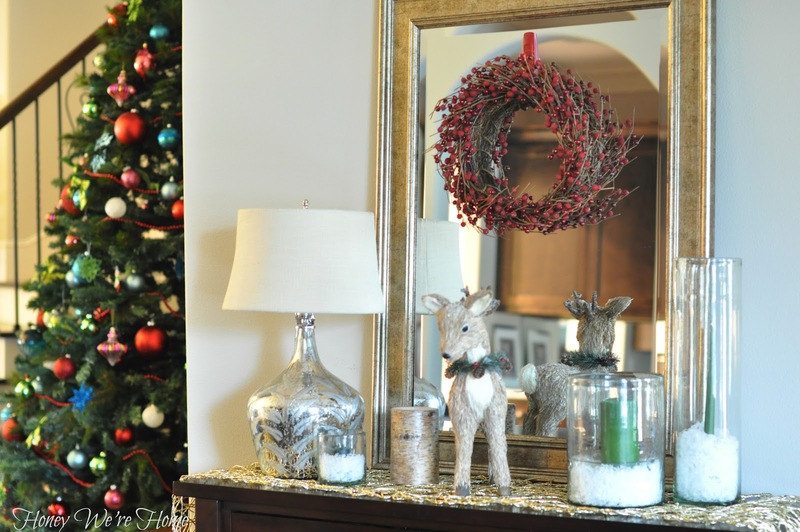 I love the mercury glass lamp and wreath! Gorgeous!! So pretty! Love the little reindeer. It looks great Megan! Have always loved that PB mercury glass lamp. How pretty Megan. That deer is so sweet. It looks great and I love the reindeer. My 4 year old son would pluck him right off that table in a heartbeat! Looks so pretty! what'd you put in your PB hurrianes?! I love that cute little deer! Very pretty!